Definitely, one of the most important steps in life is to get a job that will provide you with feelings of satisfaction and fulfillment. In order to do that you will surely have to create a resume that will attract a potential employer. You can do it traditionally using Ms.Word on your laptop or you can download one of the listed below resume builder apps. 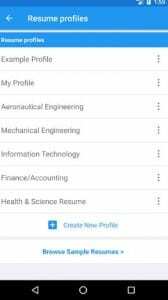 Most of these apps will help you to create an up-to-date resume matching your specialization and potential job requirements. It has many helpful templates, PDF file support, and a sharing function. You will find applications for both Android and iOS devices. With Resume Builder & CV Maker app, it became easier to create an attractive resume without a laptop and Microsoft office software. This free application has all the necessary features that will help you build a good CV and share it in PDF format. There is a big variety of templates categorized by professions: from a nurse to an accountant. You also can create portfolios and cover letters for job applications. Sharing function that covers most social media, messengers, and email services. Two modes to create a resume from scratch. Importing information feature: from PDF or LinkedIn. Editing feature: change font size, color, and section margins in your resume. The app lets you import a resume or cv in PDF or Word format. After that, all data from the uploaded resume will be extracted into a VisualCV template. Also, you can import data from your LinkedIn profile. You can choose a template that matches your characteristics. There are 10 categories to choose a template with different CVs from marketing manager to software engineer. Some templates include photos, some not. It’s up to you whether you want to attach your personal photo to the resume or to leave the resume without it. The third option for those who like to start from scratch. It presented in Basic and Visual editors. 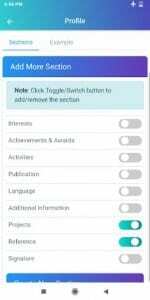 WIth Basic, you enter important information such as education and the app fill in the template accordingly. With Visual you just populate your data in ready sections and can choose your template later. The app has a high rate and lots of positive reviews. The developers quickly fix bugs and respond to complaints. This Resume Builder is one of the most popular free apps among iOS users. There is no Android version and it runs only on iPhone and iPad. 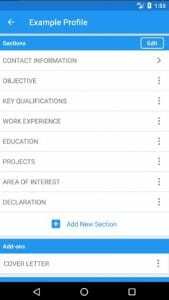 The app is easy to customize and it gives you many options to create a stunning CV so you can attract a desirable employer. The application is easy-to-use and won’t take much time to get familiar with it. Preview the resume after you’ve added most of the valuable information about yourself to see if there is something missing. In the free version, you will have one classic CV template starting with an objective and work experience. To unlock other 8 templates you will be suggested to purchase premium version for 2.99$ a week or 4.99$ a month. 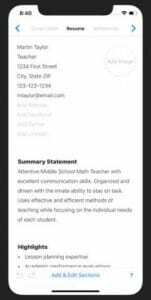 Send an attached CV created in the Resume Builder straight from the app. Don’t forget to add a decent cover letter. Editing functions. There are three fonts available for you to design your resume. You can also change the font’s size and horizontal and vertical margins. The free version has only one template and many advertisements that can be annoying when you do such an important work as building a resume. Premium version will let you enjoy the CV building process without advertisements. 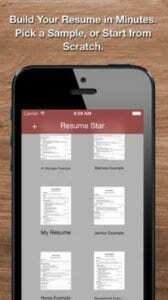 Resume Star is another app supported by iOS devices only. It has a classic well-organized interface. There are distinct sections to help you build a professional resume. Start filling the form with your contact information, introduction, and cover letter. Then add education, work experience, and references. The app will guide you through the process simplifying that task. So you definitely won’t forget any step in resume building. The result will be a correctly formatted PDF resume that will help you to get scores on your interview. 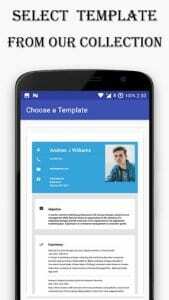 The app has 10 different professionally created templates that you can simply fill in with work-related information or use it as an inspiration to create a personalized version from scratch. A built-in spell check to avoid mistakes that can negatively impact your chances of success in the application process. 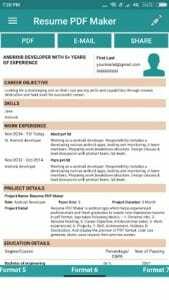 Send your resume once you have done with it or download and print it. Adjust a text changing font size and type. With the Resume Star app, you can create many resumes to adjust them to a particular employer’s requirements with different cover letters and objective. 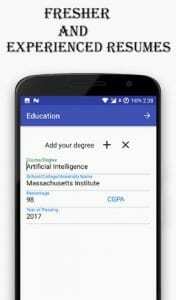 My Resume Builder app is one that you can download on your Android device in order to help you create an appealing resume. The app will not ask you to register. Simply launch the app and fill in the information step by step. In the bottom of the screen, there is a menu where you will find resume sections listed step by step: from contacts to references. Add contact information. The most important step is to add accurate information so the employer can easily contact you in the case he likes your CV. You can update any information anytime you want. Add your education background, work experiences, and projects you have completed. You can skip any step and fill it later. Add your hobbies, skills, and strengths to make the cv more attractive. Don’t forget to press the save button, because otherwise, you might have to start from the beginning. Add your personal photo and signature. This step is optional. After adding all the important information, choose either one of classic templates or colored and the resume will be formed. Having done those steps, you can then preview your resume and share it through different applications: social network or email services. The interface has a simple design and is easy to navigate. The app is free but has a lot of advertisements including full screen adds. 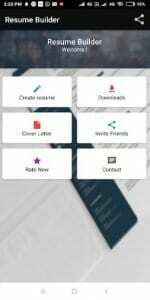 Resume Builder Free is an advanced application for Android that will help you to create an excellent professional resume. With the help of this app, you can create a good resume in 5 minutes. It does not matter if you are creating a resume for the first time or you have done it many times before in your career. You can create your cv at any place without being attached to the personal computer. The app will guide you through the process and give you some tips that you may not know. Launch the app and, step by step, start to fill in the blanks. Of course, you will have a lot of different templates to help you make a cv. There are templates suitable for financial, information technology, and health-related specialists. Having completed the building of your resume, you will able to preview it, check for mistakes or add missed information. The application won’t take much space in your device. It supports many languages but be aware, that the app was created in English, so some mistakes can appear when you use other languages. The free version of this app has a lot of advertisements that take a substantial amount of screen space in some sections. It will not distract you during the resume`s building process. 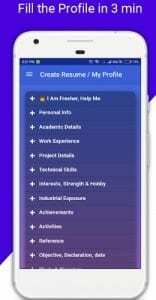 Resume Builder Pro is yet another useful app that will help you create a decent resume in less than 10 minutes. 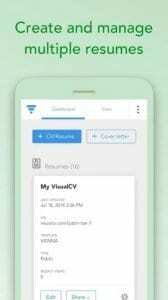 This app can be very handy at moments when you are asked to send a cv and you are away from your laptop. You can build a great and professional curriculum vitae while sitting on the bus. 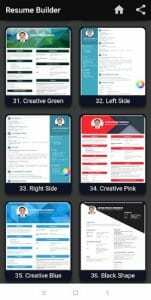 More than 20 ready-made categorized templates. Choose your specialty and add the most important information related to your job experience. It has templates for engineers, doctors and nurses, analysts and financiers. Cover letter builder. Don’t underestimate the importance of your cover letter. It is the first part that the employer will see as a well-structured presentation for your resume. 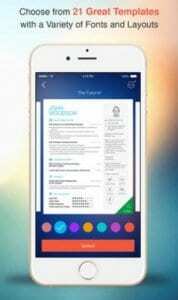 The app saves the resume in PDF format after it has been completed. All information blanks are divided into sections: contacts, objectives, academic qualifications, work experience, projects and etc. In addition, you can find many instructions in the Resume Builder Pro to help you generate a good CV and cover letter. There is no need to surf the internet because there are a few ultimate guides available for you to derive even more benefit while using this app. Resume Builder is a free and easy to operate application created to help you build your best resume. It’s supported by all iOS devices. You will not be required to format and design your resume. You will have two readymade templates to help you create it. There are about 25 more templates and resume formats that are available in the premium version. You can add your work experience, education, and achievements. Describe them as accurate as possible while leaving the resume design to the app. You can add, remove or rearrange sections. Preview the resume to see if it looks ready and then share it as a PDF. If you want to upgrade your resume by adding a photo or cover letter you can subscribe for pro version for 14.99$ a year. 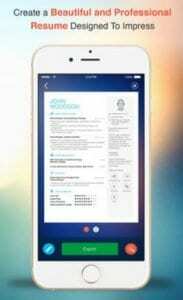 The PathSource Résumé app will help you create an outstanding resume. There are many different well-designed templates that will help you to build a good cv. PDF format. After completing your resume you can download as a PDF file or send it directly to the employer’s email. Templates. Readymade templates will let you skip the process of arranging information and creating a design of your CV. Resume`s section blanks. Fill in the blanks with valuable information about your work experience, education, and contacts. You can rearrange these sections, add or remove some of them. You can add all information once and then duplicate the CV form to change or add some new data. This way you can create different resumes suitable to apply for different job positions and employers. You can find many samples of most relevant jobs` resumes to take a look and get inspiration. The app is available for free for most iOS devices. 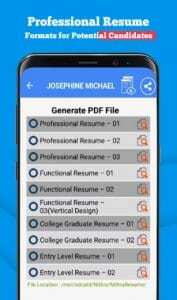 Like most of the similar apps, this Android application Resume PDF Maker can help create a professional resume in PDF format. Sometimes it’s possible to apply for a job through online platforms where you can fill in all of your professional data. Afterward, you might be required to bring a printed resume to the in-person interview in the case if you have passed that first stage of the application process. This CV builder app can simplify this task. Choose one of the 7 templates to create a well-organized resume. Fill in the blanks one by one following the instruction. Add all the necessary information including previous job experience, educational background, successful projects, and achievements. Make a resume more attractive by adding some extra information like skills, hobbies, and interests. For all of that, the app has distinct sections. You can either fill all suggested sections or remove some of them. It’s also possible to edit all the sections separately to correct the information you have put in by mistake. Mail the resume directly through the app as soon as it’s been completed. Add a cover letter to your email. It’s an important step that will attract additional attention to your resume. A well-written cover letter will give you a better chance to receive an invitation to come in for the interview. After completing each step you can preview your resume. Do not be in a hurry to send it straight to the employer. Take a closer look to check for any last-minute corrections. 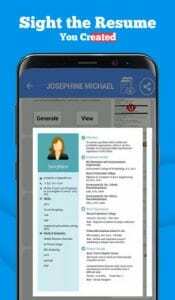 If you are searching for an unusual and advanced application, the Curriculum Vitae App for Android will be a good choice for you. You can create a stunning resume by choosing one of the 50 different templates and formats. Add a professionally written cover letter and attach it to your resume. Fill in sections, rearrange them, add or remove some of them. There are some standard sections available: career objective, education, experience, achievements, awards, interests and etc. Download a resume in a PDF format. If you want to make a good impression on a potential employer you have to create an attractive and professional resume. With the help of this app, you can find various resume formats: from simple black and white classic templates to professionally structured plain or colorful formats. There are also some creative templates made with unusual design and will be suitable for designers applying for a job. 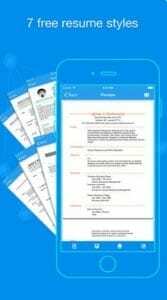 Resume Builder can be considered as a rather simple resume builder app. The app does not have a big set of functions but all the necessary features are included. Bright design and well-composed interface will navigate you through the app. Create as many resumes as you need. You will always find them in a separate section called “saved resume”. Choose one of 26 resume templates and fill your information in. You can fill the information in first then try on different resume formats. Choose to divide the information either into two columns in your CV or into rows. 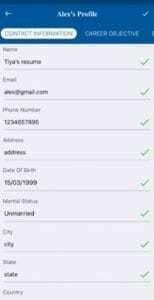 You will be notified if some important information is missing or if you have skipped the important field. All the information is divided into different sections: qualification, objective, work experience, hobbies, and languages. Attach your photo directly from the phone`s gallery. Preview your curriculum vitae and save it in PDF format. 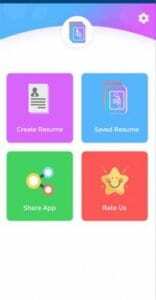 One of the biggest advantages of the Resume Builder app is that you can save your resume via social network and other popular applications like WhatsApp. With this app’s step by step walkthrough, you will be guided to create a professional resume in no time. 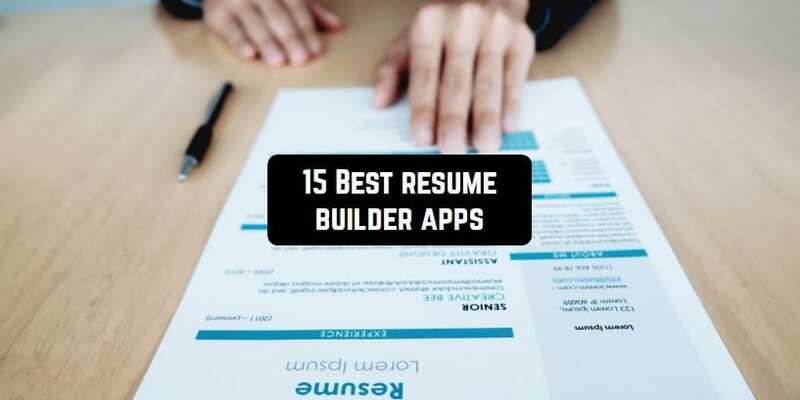 Resume Builder is certainly the app that has the biggest number of templates. 75 of them, black and white, and colored differently designed formats will suit anyone needs. You can choose a design with two columns or one with many rows. In the case you have difficulties with filling information in you may find inspiration in texts written in ready-made templates. ready resume in a PDF format. All PDFs will be placed in the download location set by default settings. Would you like to be guided through all the steps of resume writing? Then the Quick Resume app is a good choice. The app supports 10 languages including Japanese and Russian. Choose a ready-made template and generate your own resume. Fill in the blanks divided into different sections. 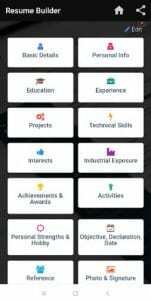 The app has all the necessary sections to add: education, work experience, contacts, and projects. There are also some additional sections such as awards, references, and interests. You can add your own modules as well. Add a cover letter to your resume. 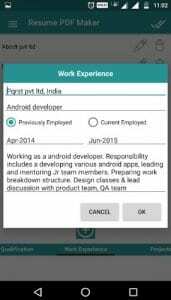 Send a ready resume directly through the app or print it in PDF. Send the resume to Dropbox. You can create many different resumes and save it. 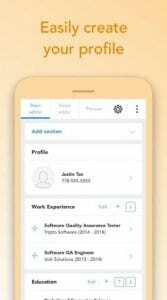 The app has a user-friendly interface that simplifies the resume building process. As soon as you open the app you will be asked to select a language from the 10 available options. You can change a language at any time in the app’s settings. The design of the app is rather ordinary and simple, so some might even find the interface to be designed unprofessionally. 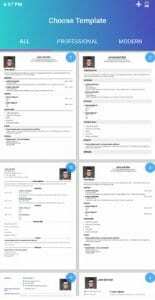 A lot of ready-made templates and resumes to choose from. All necessary sections to fill in: personal details, objective, references, education, and experience. A user can rearrange the order of sections by himself or herself. 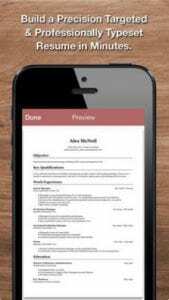 Download resume as PDF, print or share it through the app. Edit the document by changing font size, style, and margins. The app has some minor bugs that occur from time to time. First, choose a template. There are not that many templates as in other apps, only 8 different formats. The second step is to fill in the information step by step. The app will not let you move to the next step before you have completed the previous one. It will send you colored in red notifications and reminders. The last step is to save a resume in PDF format, download or print it straight from the app. 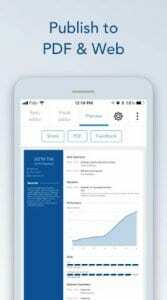 Users are able to share their ready resume directly through the app. Of course, the app has a lot of advertisement including full-screen ones.